Winemakers Alex Krause and John Locke make wine in Santa Cruz and are located centrally to the vineyards that they work with. They have access to fruit that is farmed by many third generation European farmers. They have worked with some of the great’s in the trade like California’s Randall Graham, Alsace’s Andre Ostertag as well as some small producers in Madiran and Minervois in France and Puglia and Piedmont in Italy. The diversity of their experiences is reflected in the unique personality of their wines. Pétulant naturel is Birichino’s querulous answer as to how to produce a complex and delicious lightly sparkling wine using traditional lo-fi methods. From a vineyard planted just shy of 3 decades ago up against the Santa Lucias of the Salinas Valley, the 2017 is 100% Malvasia Bianca with just a touch of malvasia juice that was added while it was actively fermenting. 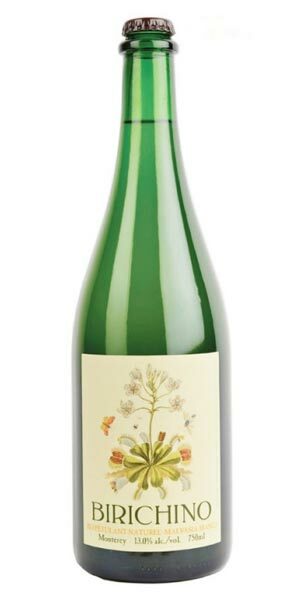 The result is something lightly “pétulant” and pétillant- subtly refreshing, soft and fragrant. Each bottle is hand filled and capped, and still has the fine lees contained within and continues to ferment and become more carbonated in bottle as it remains in contact with the yeast sediment, much like bottle conditioned craft beers. Each bottle is a variation on a theme of floral flashes of frangipani, honeysuckle, and nectarine blossom. Snap some up, this one never lasts long on our shelves!